If you've noticed that I've been MIA the past few weeks it's because I WAS IN PARIS AND ITALY. WHAT?! Long story short, my sister-in-law got married in Positano, Italy (so cool!). So John and I decided to visit a couple of other places along the way. First, Paris, a total bucket list trip for me. Then, Florence, which we've been to before. 1. For those who follow me on Instagram, I decided to wear the yellow fascinator to the wedding reception! I wore a big red hat to the actual wedding, but that's a whole another story. Other than getting to shower our pups with hugs and kisses, it's also awesome to come home to my favorite month-- October! 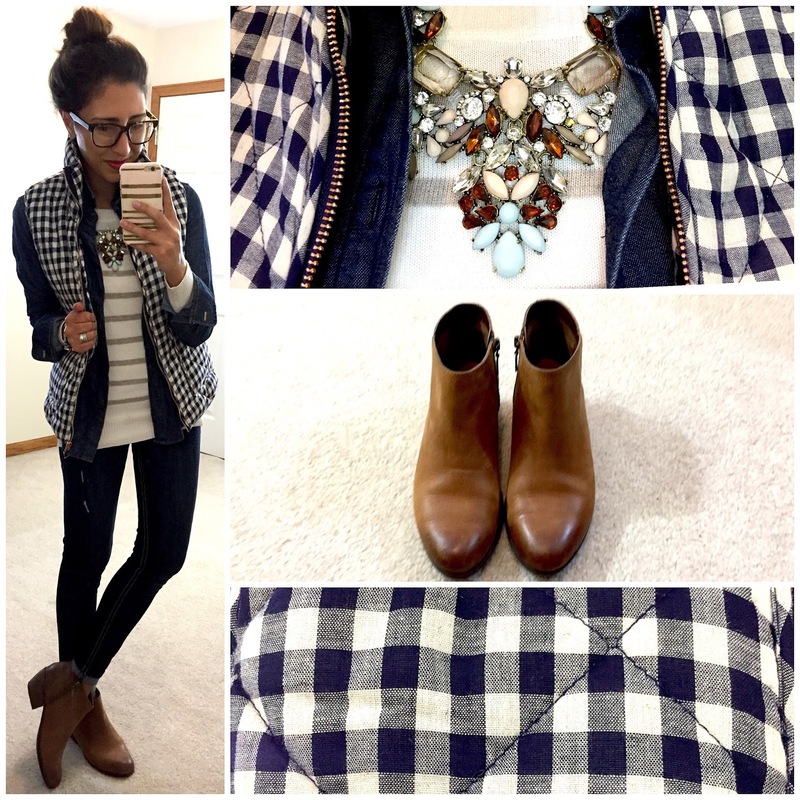 Bring on the fall weather, boots, and lots of vests! I've talked about my love for vests before and this one is no exception. I'm absolutely head over heels in love with this navy and white gingham vest from Catch Bliss. Why wear a plain vest when you can wear one with an chic pattern that will go with just about anything?! It's a great piece to throw on over a light sweater on chilly fall days, but it's also perfect for lots of layering in the winter. This vest is so cute that I've already had a couple of friends threaten to borrow/steal it from me. ;) But since most of you don't live in "borrowing" distance from me, you can get your own here! Your trip sounds so amazing!!! We went to Positano for our honeymoon last summer, and I would love to go back! Yes, it's amazing!! Although it's gotten much more touristy since the last time I was there 4 years ago. Still gorgeous though!